Perry Rubenstein Gallery (LA) presents a special project by Shepard Fairey and Neil Young in celebration of the recent release of Young’s new album with Crazy Horse, “Americana,” which features reinterpreted classic, American, folk songs. Fairey has created eleven new paintings, each one inspired by the songs, such as Oh Susannah, This Land Is Your Land and Clementine. The new Shepard Fairey paintings will be on view to the public at Perry Rubenstein Gallery in Los Angeles starting August 25th. In addition, Shepard will have a limited quantity release of the Americana Print Edition Box Set at the opening on August 25th at Perry Rubenstein Gallery. The Box Set will include a collection of screen print versions of all the new paintings, more info and official release date on the prints to come shortly, so STAY TUNED! Each of the new Fairey paintings resonate powerful messages presented in the songs, some depicting a hopeful outlook on the pursuit of a better tomorrow, while others reflect the hardships that come in trying to achieve that dream. One painting related to Clementine, which captures the words of a mourning lover whose “darling,” the daughter of a California Gold Rush miner, drowned. Here she is represented by the levitating body of a young woman draped in white, with the text “And Gone.” Another painting is related to the 1848 minstrel song Oh Susannah that features a dungaree-wearing banjo player with the text “DON’T YOU CRY FOR ME.” Other works feature a wanted poster (Travel On); an iconic image of Queen Elizabeth embroidering an American flag (God Save the Queen); and, a lonely tree, stripped bare of its leaves, in a desolate landscape (Tom Dula). For Young and Crazy Horse’s rendition of the famous 1940 Woody Guthrie song known to every school-aged child in America, This Land Is Your Land, written in response to Irving Berlin’s God Bless America, Fairey has depicted the hopeful face of a youth, set against a dramatic Western Landscape. 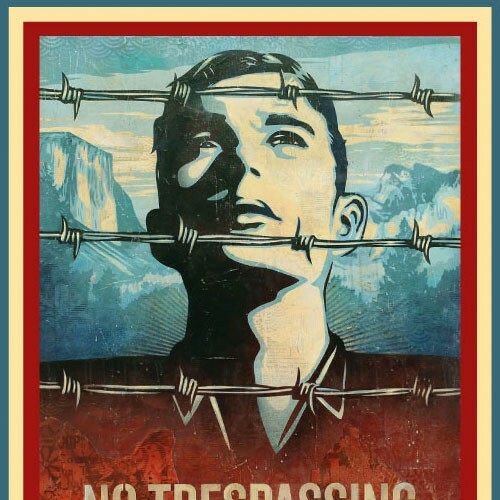 Three rows of sharp, barbed wire cross the boy’s path with the text “NO TRESSPASSING / THIS LAND IS MY LAND.” The text is derived from a variant verse Guthrie added as a social commentary during a 1944 recording session. Fairey’s paintings are mixed media on canvas, including techniques such as stenciling, collage, and screen-printing. All of the paintings measure closely to the 30 x 44 inch dimension, which is one of Fairey’s standard choices of size. “Americana” is Neil Young with Crazy Horse’s first album together in nine years and is being released on June 5 on Reprise Records.